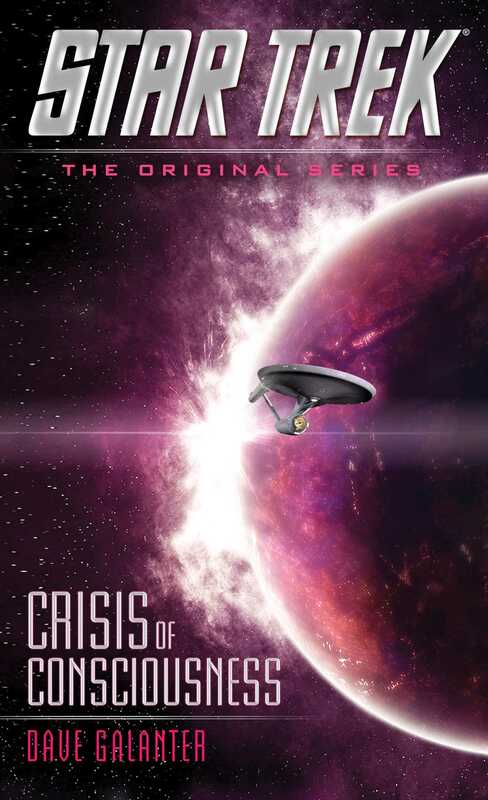 An all-new Star Trek: Original Series novel featuring James T. Kirk, Spock, and the crew of the U.S.S. Enterprise! Enterprise has arrived at Deep Space 5. We are ferrying home a delegation from the planet Maaba S’Ja. A xenophobic culture, the Maabas leaders have taken a political risk in signing this accord, which would open up trade with and offer protection to their world. Given the sensitive partisan atmosphere the Maabas president is dealing with, Starfleet Command felt that the “red carpet treatment” for the ambassador and his party was needed. Enterprise was the closest ship, and we have been tasked with the duty. When Captain James T. Kirk entered the transporter room, he found his first officer and chief medical officer already waiting. As usual, Dr. McCoy looked uncomfortable in his dress uniform, and Commander Spock only looked a bit more formal than when in his duty tunic. “I have the coordinates, sir,” the transporter chief said as he worked the console. Humming to life, the transporter chamber brightened as six columns of sparkle manifested, swirled, and then solidified into humanoid forms. “Ambassador Pippenge, welcome aboard. I’m Captain James T. Kirk.” He stepped toward the platform, his arm outstretched for the Maabas greeting. He had spent the previous evening with the Enterprise’s archaeology and anthropology officer, Carolyn Palamas, taking a cram course in the Maabas’s culture. Kirk took the tall man’s hand and shook it. It was an overly firm handshake; Kirk wondered which of the Federation politicians had taught it to him. “My chief medical officer, Lieutenant Commander Leonard McCoy, and my first officer and science officer, Commander Spock.” Kirk motioned to each in turn as the delegation descended from the transporter platform. With great warmth, Pippenge reached for Dr. McCoy’s hand and shook it happily. He then turned toward Spock. With some difficulty, the ambassador presented his best representation of a Vulcan salute. Having three fingers and two thumbs made it an interesting and somewhat awkward approximation. “Live long and prosper, Commander Spock.” The words were in heavily accented Vulcan, without assistance of the universal translator. Clearly Pippenge was looking to impress his hosts. “You honor us.” Spock nodded in respect. Kirk nodded pleasantly to all, but knew he was unlikely to remember most of the names. He trusted Spock could be called on to supply them, if the need arose. Despite being easily ten centimeters taller than the Vulcan, Pippenge was anything but imposing. His thick black hair, streaked with bars of white in what seemed to be a stylistic choice, perhaps belied his age. Telling the years of an alien was often difficult for the captain, and he tended to ask, if culturally appropriate. The rest of the Maabas party were not tall. Like most races, they came in all shapes and sizes, and several different color variations. Pippenge was a pale pinkish hue. His assistant, Tainler, was a more ruddy color. The others were different shades. One trait they shared were thin noses and deep-set eyes which made the bridges of their noses even more pronounced. “Oh, I’m sorry, Lieutenant. I just can’t find my dress boots.” She looked again in the closet she’d just closed a second before, then she pulled open every drawer of the dresser. “I’m being silly, aren’t I?” Standing, Palamas smoothed out her dress uniform, which also didn’t look too different from her standard one. “He doesn’t need everything,” Uhura assured her. “When did the captain invite you?” Uhura asked. “Carolyn, deep breath,” Uhura said. WHEN KIRK ENTERED his private dining room, most of his senior officers and many of the Maabas dignitaries were already present. He recognized Tainler, Pippenge’s assistant, though the ambassador himself had yet to arrive. She and two others of her party were engaged in some discussion with Spock. Palamas and Uhura talked with Scotty, who was in his dress uniform replete with kilt. Just as the doors closed behind him, they opened again and the captain turned to see Dr. McCoy enter. “Of course you are, my dear.” He bowed toward her apologetically, the ever-suave gentleman when a pretty woman was present. “The good doctor is wondering why no spirits for tonight’s festivities.” Kirk smirked slightly, letting Palamas know he was having a bit of fun at McCoy’s expense. “Not only that, but they’d be shocked that someone as learned and skilled as a physician would do so.” Palamas looked at McCoy with such earnest sincerity that the captain wondered if she was always such a quick study. “Cross them off the list for my next shore leave,” McCoy muttered. With a chuckle at the doctor and a nod to Palamas, Kirk sent her back toward the table just as the doors behind him opened again. Ambassador Pippenge and one of his attendants entered, and the ambassador greeted the captain and McCoy with a handshake. They were dressed ornately, with brightly colored robes that seemed to hang in a more formal arrangement than what they’d worn when they beamed aboard. “I trust you found your quarters acceptable?” the captain asked. “We’ll be happy to wait,” Kirk said. “Very well.” The captain gestured toward the table, and they all took their seats. After brief toasts by both Kirk and Pippenge about the new relationship between the Maabas and the Federation, the first course was served. The fare was a mixture of Terran, Vulcan, and Maabasian cuisine, and Kirk asked Lieutenant Palamas to explain the origin of each of the Federation dishes. To her credit, she was able to, and the ambassador was sufficiently impressed. With a bubble of quiet laughter, she demurred, but Kirk encouraged her with a nod. This was one of the reasons he’d decided to add Palamas to the dinner. Pippenge pursed his lips, and Palamas whis­pered to Kirk that this was the Maabas version of an affirming nod. “Is that why you have no interstellar exploratory programs?” McCoy asked, taking a bite of his salad. “Understandable,” Spock said, “for war refugees.” The Vulcan never seemed to eat at these gatherings, and yet the captain knew his plate would be half empty when removed from the table. “Oh, no, I meant no offense.” Pippenge was obviously flustered and embarrassed. “Indeed.” Spock nodded his agreement. “Does he?” Grinning, the doctor gazed at Spock, bemused. “Phantoms?” Kirk asked, also entertained by the notion of Spock as a specter. “I understand,” Spock said agreeably. Pippenge was quiet. He shifted his weight, leaning one way in his seat, then the other, but said nothing for quite a time. What must he be contemplating? Kirk wondered. Since joining Starfleet, he’d always found meeting new life-forms exhilarating. Occasionally more than that, but always at least that. That was one of Starfleet Command’s worries as well. However, the Federation Council was untroubled. Their opinion was that a culture intelligent enough to make breakthroughs in science, to accept the Federation as an ally, could be eased into other frontiers, even ones alien to themselves. “Most are, or we’d not have signed the treaty.” The ambassador’s quick reply made Kirk think this was one of Pippenge’s political talking points. Likely many Maabas shared Dr. McCoy’s concerns. “Some aren’t as eager,” Kirk said. “Here, here,” McCoy said. The Enterprise officers in attendance applauded. The Maabas officials sang in a cheerful tone. Pippenge attempted both, and the captain couldn’t help but smile. There was much to celebrate. Most treaty negotiations didn’t go as smoothly as they had with the Maabas. They’d asked for very little from the Federation: trade, protection, and cultural and scientific exchange. In return, the UFP wanted much the same. The previous surveys and exchanges, which had given Lieutenant Palamas the information in her report, had shown that the Maabas had great intellectual flexibility. In addition to their unique scientific research, their philosophy dovetailed nicely with that of the Federation. They were a united planet with a democratically elected government, there had been no wars since they colonized their planet, and they shared many of the same principles as the Federation. Kirk raised his glass to make his own toast, but just as he was taking a breath, the door to the corridor slid open. Skent, the missing Maabas attendant, entered with an Enterprise security officer close behind. “A puckering of the lips is like a human shake of the head,” Palamas whispered to Kirk. He hadn’t noticed she’d joined him. The captain nodded his appreciation. This was just the sort of understanding of alien body language he needed from his A&A officer. “Ambassador, you and your aide were also seen on the engineering deck.” Kirk had seen the report earlier, but thought little of it. Guests could get turned around on a ship as big as the Enterprise. One occurrence could be easily dismissed. Two, however, made the hairs on the back of Kirk’s neck stand up. Was Pippenge displeased with Skent because he was where he shouldn’t be, or because he was found where he shouldn’t be? “He had this on him.” Baumgartner handed Kirk a small device that fit into his palm but had no obvious screen or method of input. “A scanning tool and recording device,” Pippenge said. “My brother is in the Science Directorate. He asked me to record anything of interest,” the attendant said, unwilling to meet Pippenge’s eyes. “On the Enterprise?” Kirk asked. The captain pressed his lips into a thin line and wondered if that would be taken as a sign of acceptance by the Maabas delegation. If so, perhaps that wasn’t a bad thing. He didn’t like it, but he didn’t have evidence that there was any malicious intent. Amiable smiles and mild discussion followed until the hour grew late and the ambassador and his party excused themselves. “Thank you, sir,” she said pleasantly, and joined Uhura, who waited for her near the door. “May I walk you back to your cabins, ladies?” Scotty approached them, and the three left together. “Since when?” McCoy had loosened the neck on his dress uniform enough that the black undershirt showed through a V shape he’d opened over his chest. “I’m on duty.” The captain cradled the glass in his hand, sipped the drink just to keep nursing it, then placed it on the doctor’s desk. “What look?” His brows jutting upward, Kirk glanced at McCoy. With a chuckle, Kirk shook his head. “Not exactly. But the Romulans . . . ?” He let the sentence trail off, and the notion hung between them. “Not their general area of influence,” McCoy said thoughtfully, nursing his drink. “Deep Space 5 is near the Romulan Neutral Zone.” The captain tilted the glass toward himself and watched the liquid contents run against the bowl as he set it right again. “A Federation-Maabas alliance would be a concern for the Romulans.” He raised the glass to his lips and took a sip, just as the bosun’s whistle sounded again. “Bridge to Captain Kirk.” Spock’s voice this time. “We’re tracking an unknown vessel on an intercept course.” The Vulcan’s voice was calm as usual, but had a serious tinge. The doctor followed him toward the door. “­Romulans?” McCoy called as the captain sped up the corridor. THE LIFT TO THE BRIDGE seemed too slow, but Kirk knew it was the same speed as always. When the doors slid open, the captain was shocked, but not surprised, to see Pippenge standing just outside the turbolift entrance. The security officer, his weapon already drawn, pulled the ambassador out of Kirk’s way. “I saw the yellow alert, and we were informed we were already within the bounds of our system,” the ambassador was telling the officer. At the captain’s nod, the security man holstered his phaser and stepped back. Nervously, Pippenge pursed his lips. “Yes, Captain, I’m very sorry. I was simply worried. Please forgive me.” At least the man knew he shouldn’t be there. Kirk needed to focus on the situation—not the ambassador. He gently pulled Pippenge toward the command chair as the lift doors opened again. Scotty stepped out and hurriedly moved toward his station. The captain nodded and descended to the command well as Spock moved to his science station. Lieutenant Sulu and Ensign Chekov were at the helm and navigation consoles respectively, quietly awaiting their orders. “The vessel?” Kirk asked as he lowered himself into the center seat. Not a Romulan vessel. Thoughtfully stroking his lip with a finger, Kirk wondered what new race this could be. Being heavily armed didn’t necessarily mean they were a threat. The Enterprise was armed to defend herself, but such weapons could be seen as offensive by strangers. Turning toward the sound of the lift opening again, Kirk noticed that Lieutenant Uhura had changed into her regulation uniform. With a nod to the relief officer, she slid smoothly into her chair. “Aye, sir.” The ensign tapped quickly at his console. On the main viewscreen, the image changed from a relatively empty starscape to one where a small dot grew larger, noticeable only because an indicator on the screen pointed out that it was the vessel in question. A larger, more impressive view of the approaching ship centered itself on the viewscreen. The data on Sulu’s tactical display stated it was only slightly larger in length and width than Enterprise. Its mass was seven times greater. Where Kirk’s ship had a certain grace, with lines that suggested a design of intended beauty, the unknown vessel was a chunk of a craft, not quite cylindrical. It had no curves—just coarse edges and multi-level ledges that shaped its form. If there were standard warp nacelles, they were hidden within the bulk of the hull. It was either painted dark or naturally so, and its gray form almost disappeared against the black starscape. It looks, Kirk thought, like a crumbling brick. An imposing one. “How good are your planetary defenses?” Kirk turned slightly toward Pippenge and met his gaze. The speakers crackled to life, and as the voice was interpreted, presumably accurately, Kirk felt his throat tighten.